* Kindergarten art, that is. Those are two giant rivers of lava on each side of the volcano, and an extremely shallow sill feeding the eruption. And I think the magma chamber is sitting on top of a loosely packed gravel deposit. This is the first of four pictures, which illustrate show lightning strikes that penetrate into the mantle, a gigantic landslide (which somehow ends up on the opposite side of the volcano from its scarp), and a hurricane that eventually cools the lava. This may be evidence that my child will grow up to work on a combined re-make of Dante's Peak, Volcano, and In the Path of a Killer Volcano. "In the Path of a Killer Volcano" has been a part of my Intro Geology, Environmental Geology, and even Petrology classes for as long as I've been teaching. Here's my Pinatubo assignment - pretty much unchanged since I originally wrote it. For as long as I have owned copies of "In the Path of a Killer Volcano" (and I own two VHS copies and one DVD) the image of the lava fountain at Pu'u O'o has graced the cover. There's an image of Pinatubo on the back, but the front has always been Pu'u O'o. My earliest copy was purchased when I was a grad student at UW-Madison and had the original (unedited for sensitive high-schooler ears) audio track. Unfortunately this copy has become unplayable over the years due to heavy use. Both the second VHS copy and the more recently released DVD copy have a "butchered" soundtrack that silences all of the mildly strong language that (IMHO) was an important part of setting the context of realtime eruption prediction efforts. If anyone has a functional copy of the original VHS tape with the full audio track I'd be really interested in acquiring it. At one point I also had a copy of the NOVA episode about Mount St. Helens, "Anatomy of a Volcano" (NOVA Season 8, Episode 16) but to my unending chagrin I seem to have lost or misplaced that copy. I'd REALLY like to get a copy of that if someone can help me out - it's probably one of the single most memorable NOVA episodes ever produced (right up there with "In the Path of a Killer Volcano") and probably the single most important NOVA episode that inspired me to get into geology in the first place. 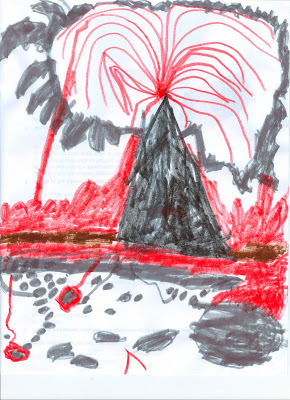 Most relevent to the current post, though, the producers began the scientific explanation of volcanic plumbing in the St. Helens episode with a kid's crayon drawing of a volcano. Minor correction: The VHS versions both had the Pu'u O'o lava fountain on the cover. The new DVD has the June 12, 1991 blast cloud on the cover. Kim, I love volcano art of all kinds, so thanks for sharing. Maybe he will be our next volcanologist! Ron, thanks for your Pinatubo link. That eruption had special personal significance, so it's always nice to find out more. ron I am looking for the same video (Anatomy of a Volcano). Can you please let me know if you find it somewhere? Panel discussion on women in science - ideas? High metal concentrations in fluid inclusions?